ITEM #106 NEW ELECTRIC HOLO-GLAM 1g. ATTENTION TOP COAT CAN ONLY BE CURED FOR 8-10 SECS BEFORE APPLICATION. PLEASE READ DIRECTIONS. PLEASE FOLLOW DIRECTION BELOW, AND WATCH THE VIDEO. PLEASE KEEP IN MIND THAT WE ONLY USE POOCHIEZ NAIL TOP COAT AND WE DO NOT KNOW HOW OTHER TOP COATS WORK. 2. ADD POOCHIEZ NAILS SUPER SHINE UV/LED TOP COAT. YOU MUST ONLY FLASH CURE FOR 8-10 SEC ONLY, IF CURED LONGER THAN THAT HOLO-GLAM WILL NOT STICK. IT'S IMPORTANT THAT YOU TEST OUT ONE NAIL FIRST TO FIGURE OUT YOUR CURING TIME, SOME UV/LED LIGHTS ARE STRONGER THAN OTHERS, THAT WAY YOU WON'T WASTE YOUR TOP COAT. 3. 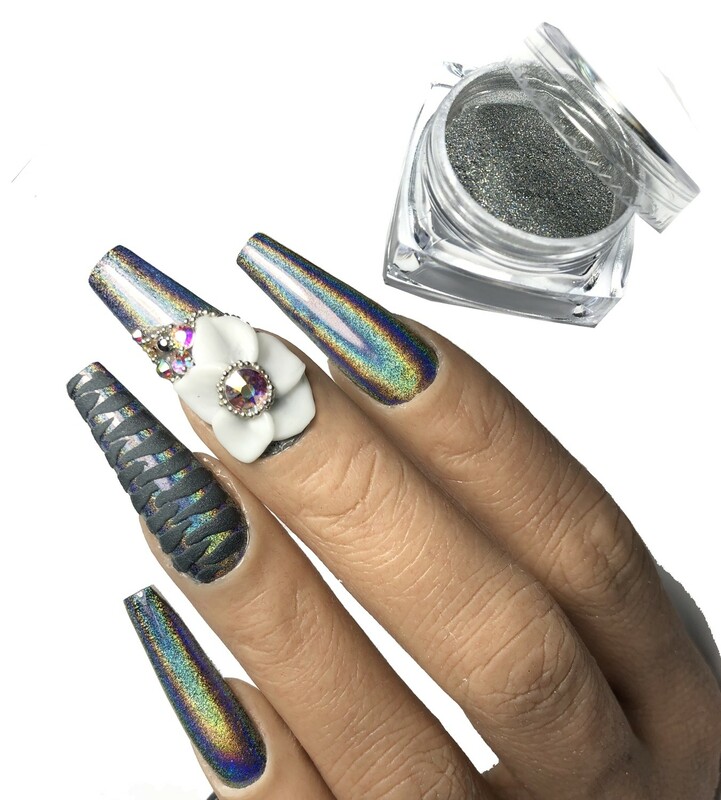 APPLY HOLO-GLAM PIGMENT WITH APPLICATOR, THEN CURE FOR 60 SEC. 4. ADD POOCHIEZ NAILS SUPER SHINE UV/LED TOP COAT THEN CURE FOR 60-90 SEC DEPENDING ON HOW STRONG YOUR LAMP IS. MAKE SURE TO CAP THE EDGES OF THE NAIL. THIS COLOR SHOWS UP IN A ROOM WITH NATURAL LIGHTING, BUT IT REALLY SHINES WHEN IN THE SUN.